Employees are able to request some time off using My Requests. If you would like to see your allowance simply go to My Allowance. 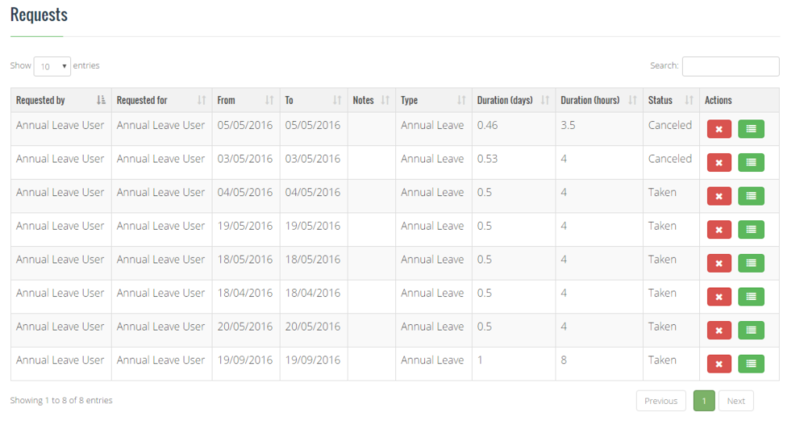 Managers will be able to see their teams allowances using My Team’s Allowances. All requests can be approved or rejected in My Teams’ Requests. In this section we will explain standard employee features. If you want to request time off, select the ‘My Requests‘ button. This will prompt the ‘New Request’ form. Select the type of leave you want from the ‘Request type’ drop down list. Select when you want the leave to begin, using the ‘date picker’ button and the ‘All day / AM Only / PM Only’ drop- down box. Select when you want the leave to end, using the same method. You can choose to cancel requests, which have not yet been taken by clicking ‘Cancel’ next to the request. If the status of a request is ‘Pending’, then it will be canceled immediately. If the status of a request is ‘Approved’, then your manager must approve the cancellation. An email will be sent to your manager informing him/her of your wish to cancel. Your manager will act upon the request to cancel, and you will receive an email of the decision. Naturally, if an absence has already been taken, it cannot be canceled. If you cannot see the request you are looking for, click the list of page numbers at the bottom right corner of the grid, and you can flick through the ‘pages’ or requests.